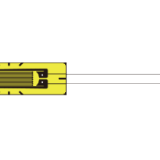 Our range of high elongation strain gauges are ideal where applications are expected to exceed the 5% strain limit for our general purpose range of gauges. 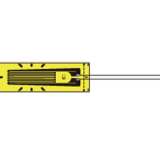 Developed to measure strain in elastic to plastic region on structures, the KFEL series foil gages can measure strain as large as 10% to 15% with simple tension strain. While the KFEM series ultrahigh-elongation foil gages can measure strain in elastic to plastic region on structures and are suitable for large strain measurement or rupture tests of metals (Steel, stainless steel, aluminum) and plastics (Polyethylene, polypropylene).